The growing epidemic of obesity in America is giving rise to an increasing number of secondary pathologies and injuries. 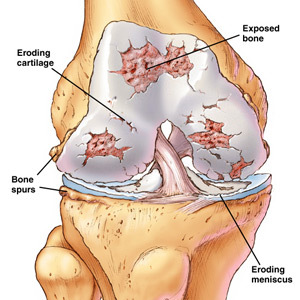 These pathologies include coronary artery disease (CAD), type II diabetes, and osteoarthritis (OA), the latter of which is causing an increase of total knee replacements (TKR) in America every year. Obesity causes a decrease in this population’s rehabilitation prognoses, which is attributable to both internal and external factors regarding these patients. Among these factors are a doctor’s right to decline surgery, pathological issues pertaining to obesity, patients’ abilities to safely comply with a rehabilitation regimen, and also pre-and post-operative weight loss. Doctor’s ability to decline surgery, along with obese TKR candidates’ poor prognoses, is causing increasing numbers of candidates to go without surgery. Many surgeons are denying obese patients’ requests for TKR because of their poor prognoses, but these patients argue that the only way they can lose weight to increase their prognoses is to undergo surgery. This report reveals the benefits of incorporating a pre-and post-operative weight loss protocol involving nutritional counseling and low impact cardiovascular exercises into obese TKR patients’ pre-and post-operative therapy routines. This report also includes doctors’ reasons for the denial of obese patients’ TKR surgeries, the effects of obesity on the rehabilitation of a TKR, and a nutritionist’s and physical therapist’s beliefs about the effects of a pre-and post-operative weight loss protocol and their exercise and dietary recommendations for obese TKR candidates’ weight loss; however, this report does not offer a specific weight loss protocol involving exact food portions, exercise durations, sets, and repetitions. Implementation of a pre-and post-operative weight loss protocol for obese TKR candidates must occur as soon as possible to decrease the number of surgeries that doctors deny. The obese TKR patients are not the only group feeling the effects of doctors’ denials. Physical therapists and the doctors themselves also must cope with the outcomes of these refusals. These members of the health care community need such a protocol to increase the quality of care they provide their patients, while the patients need the protocol to increase their chances of receiving surgery, and improving their quality of life. If you know someone who has been denied a total knee replacement because of their BMI/weight, let them know there are options, and there are doctors who will still operate. Great stuff Mike! As a chiropractor, the more I treat patients, the more I realize that I’m not a magician. While I’d like to fix 100% of the chronic pain patients that come through my door, it’s not always possible. I continue to try to fix them, even decreasing their fees so they’ll continue to see me. The problem is that when reality is trailing my prognosis and results are lacking, my reputation suffers. I imagine that certain surgeons don’t want to operate when they feel that it will not be effective. Still, our patients need to get help somewhere. Recommend that the patient enroll in an HMR Shake Program. All patients are under medical supervision and achieve rapid weight loss from eating nothing but shakes for several months. The pleasure of losing weight outweighs any boredom from eating the shakes. Class attendance required. The classes emphasize exercise programs (so many calories of exercise required per week) and maintenance diets once a certain amount of weight has been lost. Harvard Vanguard Associates in Boston is recommending this program for its patients. HMR programs are available in many parts of the country. There is also now a program which can be done by telephone. Shakes may be purchased for use from time to time, especially during the holiday season. From the friend of a patient who lost fifty pounds. As always, thanks for reading. If I didn’t know you I would have said “what the heck” to the shake program, but after talking with you and your results with the HMR shake program it is hard to argue. As with everything, for everybody, it needs to be individualized, and if someone is having a difficult time losing weight this may be an option they should explore. The main point of the article (if you or anyone else can get through my elementary writing) is that these patients actually can still exercise, and they can still lose weight. In regards to the article you sent me, many people argue the validity of BMI in regards to outcomes of these patients. BMI is just a number, the fact that obese, over-weight, etc are labelled on these numbers should not actually matter. The BMI tells MDs that at a certain mass/body there are more stresses on these people’s tissues, than people of lower BMIs, regardless of it is fat or muscle. I am borderline “over-weight” for the BMI, but all this tells me is that per the amount of body I have, the amount of mass I have on it causes a certain amount of stress. Once again this highlights the need for insurance to start looking at individual cases, motivation, patient histories, etc, and get away from looking at one number to determine how a patient is going to do. Patient expectations are a huge determinant too, and as you know, patient education always helps.